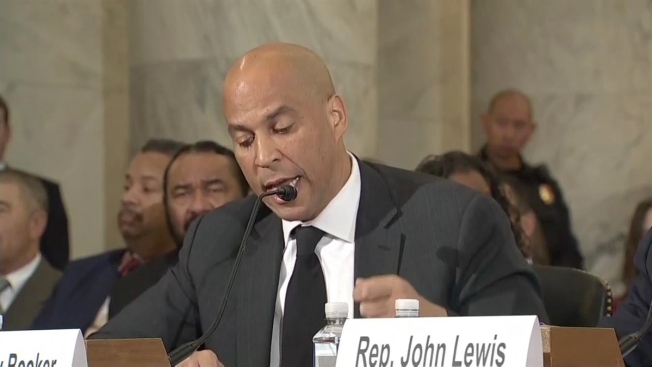 New Jersey Sen. Cory Booker, in a sharp break with tradition, testified against his colleague Sen. Jeff Sessions on Wednesday during Sessions' confirmation hearing to be attorney general. It is considered unprecedented for a sitting senator to testify against another senator during a cabinet confirmation, with Booker's office saying the Senate historan couldn't find another instance of a sitting senator testifying against a colleague in a Cabinet hearing. On the same panel as civil rights icon Rep. John Lewis, the New Jersey senator from Newark acknowledged the mutual respect between himself and the Alabama senator despite their political differences. However, he said that Sen. Sessions' record does not reflect his ability to handle the necessary call of duty he will be expected to undertake as U.S. Attorney General. "Senator Sessions has not demonstrated a commitment to a central requirement of the job — to aggressively pursue the congressional mandate of justice for all," he said. "At numerous times in his career, he has demonstrated a hostility toward these convictions, and has worked to frustrate attempts to advance these ideals." Booker added that Sessions would obstruct the national bipartisan movement towards justice reform, particularly for maginalized groups like the poor and people of color. "The arc of the universe does not naturally curve toward justice. America needs an attorney general who is resolute and determined to bend the arc," he addressed the room of legislators. "Senator Sessions' record does not speak to that desire, intention or will." He ended his testimony by urging his colleagues to oppose Sessions' nomination. In an MSNBC interview on Tuesday, Booker acknowledged the gravity of the moment. "Please understand, I think these are extraordinary times, and they call for extraordinary measures," the Democrat said. Arkansas Sen. Tom Cotton was displeased with Booker's testimonial remarks, calling them an "attack" on Sen. Sessions in a Wednesday afternoon tweet. He also made an odd reference to an "imaginary friend" of the New Jersey senator he called "T-Bone," referring to a story Booker used to tell about a drug dealer who once threatened Booker's life, then came to him for help when he ran into legal trouble. ". @CoryBooker attacks on Jeff Sessions are so far-fetched, I half-expected his make-believe friend T-Bone to be next witness," Cotton tweeted.
.@CoryBooker attacks on Jeff Sessions are so far-fetched I half-expected his make-believe friend T-Bone to be next witness. In the first day of testimony on Tuesday, Alabama's Sessions vehemently rejected charges that he had made racist comments in past, and vowed to remain an independent voice in the Trump Administration. Congressman John Lewis, who was beaten on the Edmund Pettis Bridge during the 1965 Selma to Montgomery marches, said that America needs someone who won't be afraid to stand up and speak out against injustice. "We need someone who's going to stand up, speak up and speak out for the people that need help," he said. "We need someone as attorney general who's going to look out for all of us, not just for some of us."